The Paloma Blanca Fall 2016 Collection of wedding dresses showcase iconic elements of Old Hollywood glamour defined by the Golden Era. Wedding dresses that enhance a bride’s features by highlighting their individuality. This season, Paloma Blanca took classic looks and infused each design with old-school Hollywood appeal keeping a bride’s style chic, modern and totally wearable today. This collection epitomizes Old Hollywood glamour with sophisticated, feminine styles that range from strapless, flouncy designs with floral appliques and textured lace patterns to gracefully seductive gowns that enhance the feminine silhouette with sleek fabrics. Paloma Blanca’s Fall 2016 Collection embraces the Golden Era fashion trends that effortlessly radiated through those decades underscoring a timeless appeal with iconic elements that make them a must have for today’s bride. Simple to complex art deco lines and patterns were used while keeping in mind the affordability factor Paloma Blanca is renowned for in the wedding industry. Brides will find a wider range of fabrics and styles that accentuate the waistline creating a playful yet sensual and understated look. Specific detailing to back designs were a focus this season, giving a bride an unforgettable and captivating 360-degree view for their admirers on their wedding day. Designed with the classic romantic bride in mind, Paloma Blanca fuses ageless silhouettes with modern, enthralling details, mesmerizing the traditional bride and charming the modern bride alike. 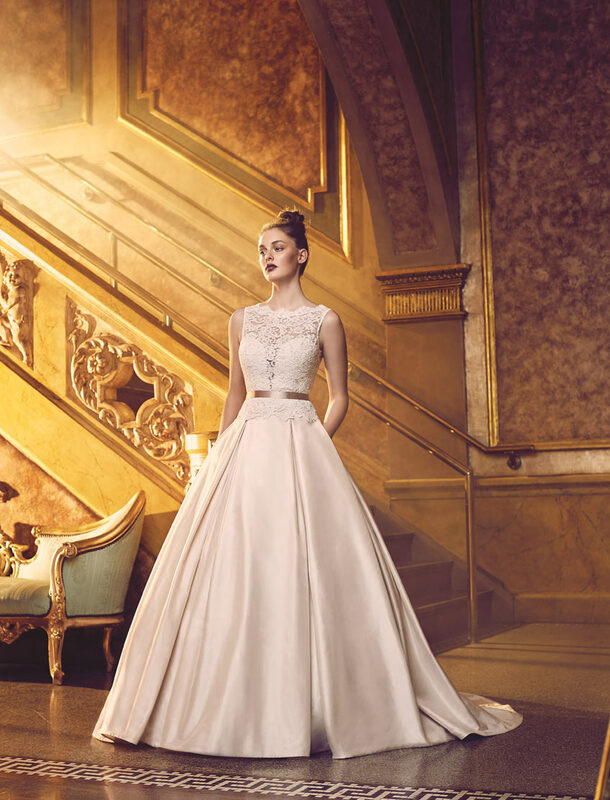 Paloma Blanca’s Style 4704 and Style 4706, two of the collections most distinctive gowns, are examples of how an artful blend of refined styling creates eye-catching drama. Styles 4714 (left), 4703 (right) and 4701 in the New Collection are reminiscent of the Art Deco era. Simple angular lines with slinky, seductive silhouettes that exude a more minimalist, exotic and lavish style while giving shape to the Avant garde Neo-classic column origins of that fashion period. Stunning thread-craft laces blended with bead patterns and mixed fabrics of Styles 4716, 4700 and 4713 call to mind the legendary Gatsby era playing on the opulence of these times and applauding today’s intricate laces which are more dazzling than ever. Top of mind for Paloma Blanca was to design glamorous wedding dresses that are attractively affordable without abandoning luxury and quality craftsmanship. Each gown is Made in Canada and pays homage to the new journey a bride embarks on during her vow exchange – one of love!